This Quick Start guide will walk you through the basics of setting up the most common survey logic – conditions on survey items. For example, you could set up a condition to show question #2 if the answer to question #1 was “A” or the current date was 04/01/2017. For simplicity’s sake, this guide will show you how to set up a simple item condition based on the answer to a previous question. 1. Add the question that you want to base your condition on. 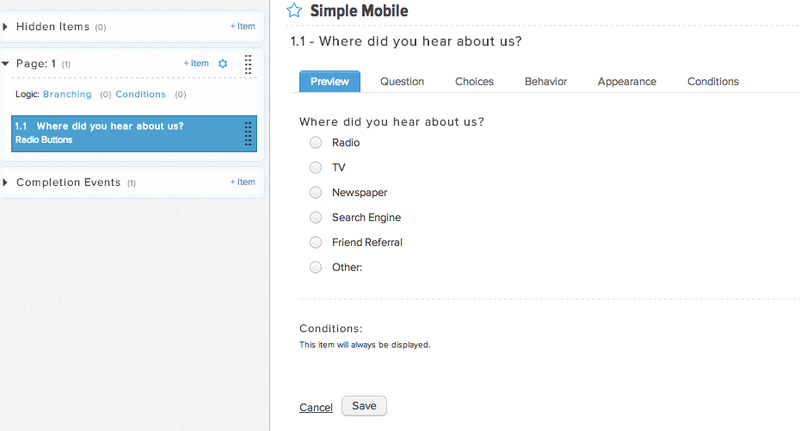 In this case, we have created a simple Radio Button question. 2. Add your follow-up or conditional question. In this example, if someone chooses “Search Engine” in question #1, we want to ask a follow-up question, “Which search engine did you use?” In Checkbox, the follow-up question can be located on the same page as the initial question or on a subsequent page. 3. Add a condition to the subsequent question. 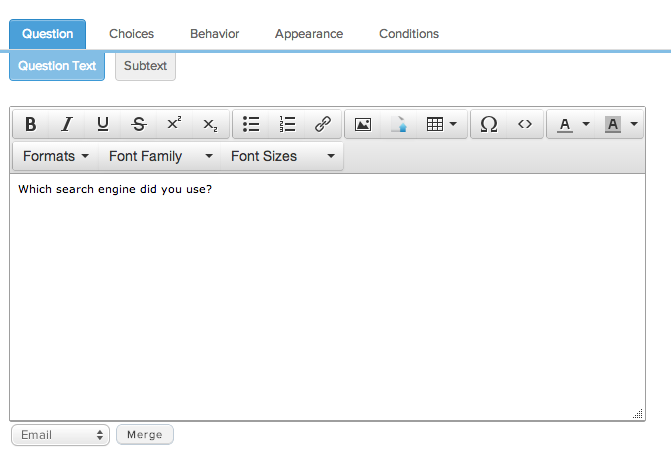 Click the Conditions tab on the item editor of the follow-up question and click the New Condition button. 4. Set up your condition. In the screenshot below, we add a condition to show the second question if the answer to the first question is “Search Engine.” Make sure you click the “Add” button to save your condition. NOTE: If you are adding more than one condition, make sure you choose the correct radio button option above your conditions. The “ANY” option will cause your follow-up question to appear if one or more of your conditions is true, while the “ALL” option will cause your follow-up question to appear only if all conditions are true. 5. Test your condition! Don’t forget to run through your survey a few times and have others test it, especially if you have a lot of conditions, to make sure everything is working correctly. Use the Test link by clicking Share -> Test in your survey editor.